The AAPA logo is derived from rock art in the Anbangbang Shelter at Burrunguy (also known as Nourlangie Rock). It is a popular rock art gallery open to tourists within Kakadu National Park. 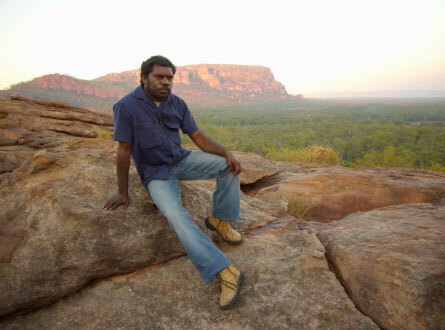 Burrunguy and the art site are located within the country of Gunjeihmi-speaking people with members of the Djok, Mirarr, Murumburr and other clans holding custodial rights and interests in the area. The image from which the logo is drawn depicts Bining (men) and Daluk (women) in the West Arnhem x-ray style. 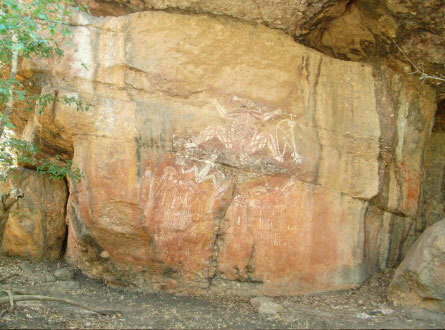 The original images date from 1964 and were painted in natural ochre pigments typical of other rock art in the region. The artist is Najombolmi from the Badmardi clan who was a skilled and admired artist. Najombolmi was also known as Barramundi Charlie and he worked in the Alligator Rivers region as a bufffalo shooter, on cattle stations and local gold mines. He died in 1965. His artwork at the Anbangbang Shelter forms one of the most renowned rock art galleries in northern Australia and includes famous images of Namarrgon the lightning man, his wife Barginj, and Namanjolk a malevolent spirit. These images, along with many others in Kakadu, were one of the reasons why Kakadu National Park attained World Heritage status. With permission from the custodians of Nourlangie Rock, the Authority has used the Najombolmi’s artwork for its logo for more than two decades. More recently custodians have given permission for the logo to be revised as part of consultations with the AAPA to register Burrunguy and the surrounding area as a sacred site under the Northern Territory Aboriginal Sacred Sites Act.